Published: Oct 18, 2011 to ? 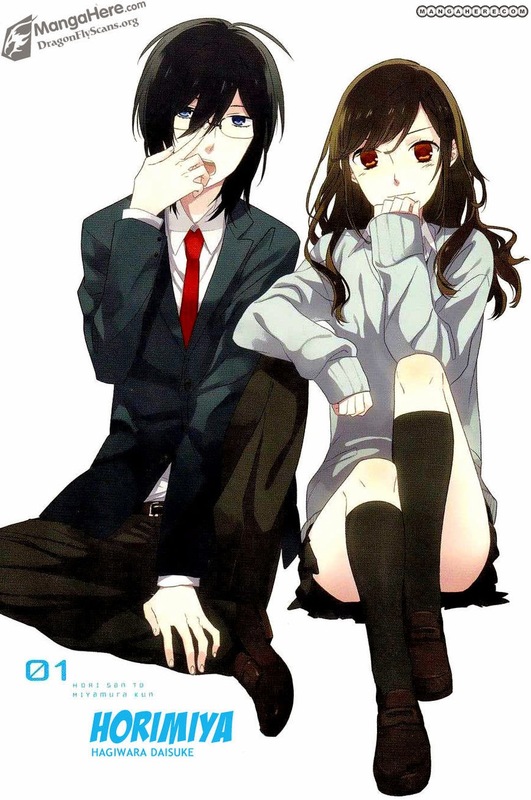 Horimiya may look like your average shoujo romcom manga but its not! 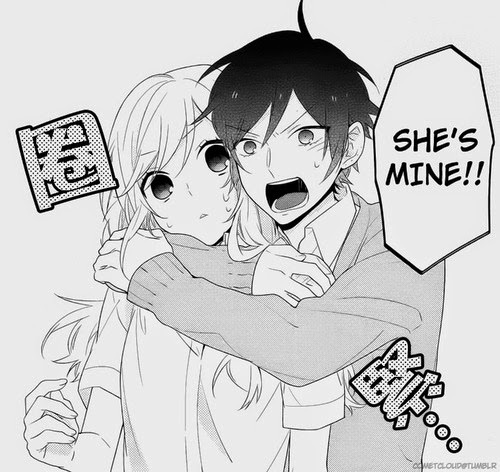 Horimiya is the shining light amongst the excessive flood of rehashed high school romances. There, I said it! So pick it up and read it cause this manga is very special and unique. But what makes this manga so special? It has the same cliché scenario, after all: a popular female lead, a shut-in otaku male lead, high school setting; the list goes on and on. The premise may be unoriginal, but Horimiya excels greatly in the one aspect that most romances fail to deliver. The amount of intimacy that can be felt between our two lovers, Hori-san and Miyamura-kun, never ceases to amaze me. Unlike most romances, their love for each other never feels forced. Author did a delicate job of developing the relationship between Hori and Miyamura so that their romance doesn't seem strained but rather genuinely real. Horimiya's story has refreshingly fast pacing, unlike other romances where it seems to take forever for the main couple to realize their feelings for each other. The moment from when Hori and Miyamura meet to when they start dating moves along without any conflicts that feel stretched out into many chapters. The drama of the series is dealt with immediately and any misunderstandings aren't painfully drawn out. Hori is a very popular girl at her school, so she has to face the doubtful and negative reactions from people discovering that she's dating a "closet otaku." 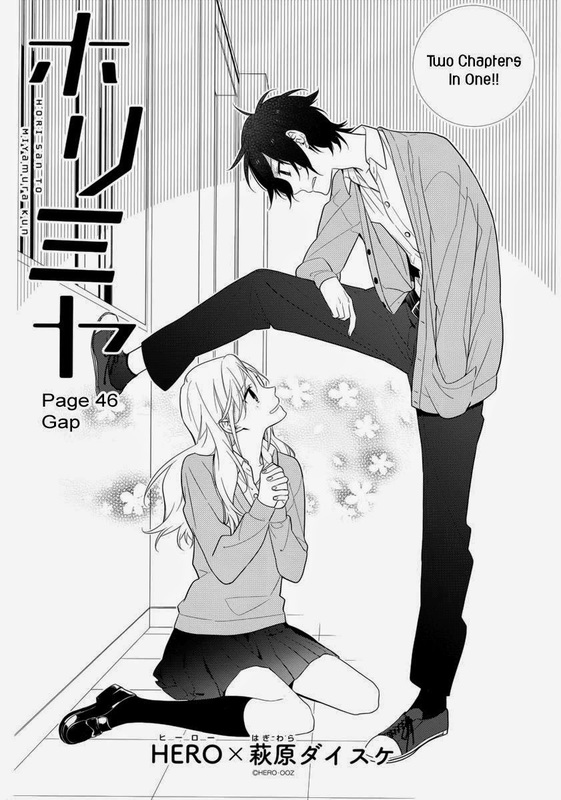 Miyamura, who had been ostracized all of his life, struggles to gain the self-confidence to see himself as someone who can make a great girl such as Hori happy. 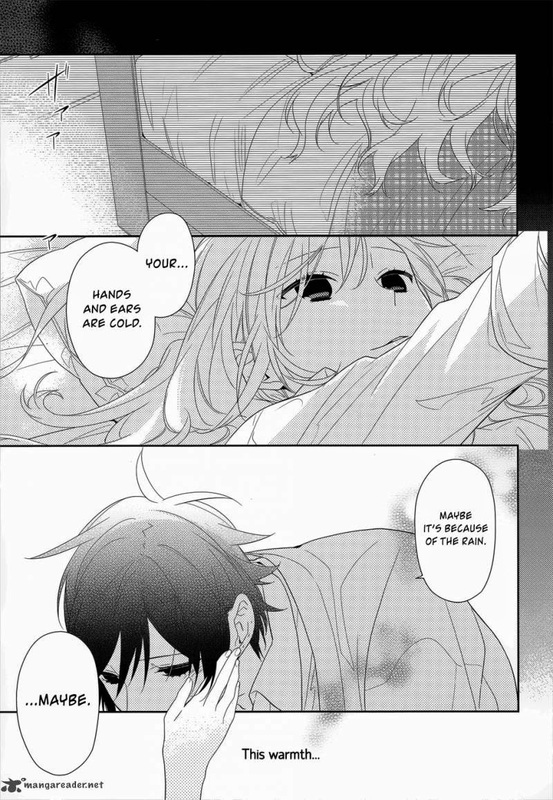 The story brings in a fresh air through Hori and Miyamura overcoming their individual flaws and the problems that arise from an odd couple such as theirs. The characters are what makes this manga above average. Especially Miyamura Izumi. In school, he is seen as a shady guy with glasses and a possible otaku. Looks can be deceiving though. Miyamura is in fact, not a otaku and looks like a a punk rock kind of guy with 9 piercings and a bunch of tattoos. In reality, he is actually an airhead that only excels in physical education and health despite his looks in school. Hori Kyokou is the MC of the manga. In school, she is cute, smart, and popular. After school though, she goes straight home and becomes similar to a housewife. She is also a sadist. 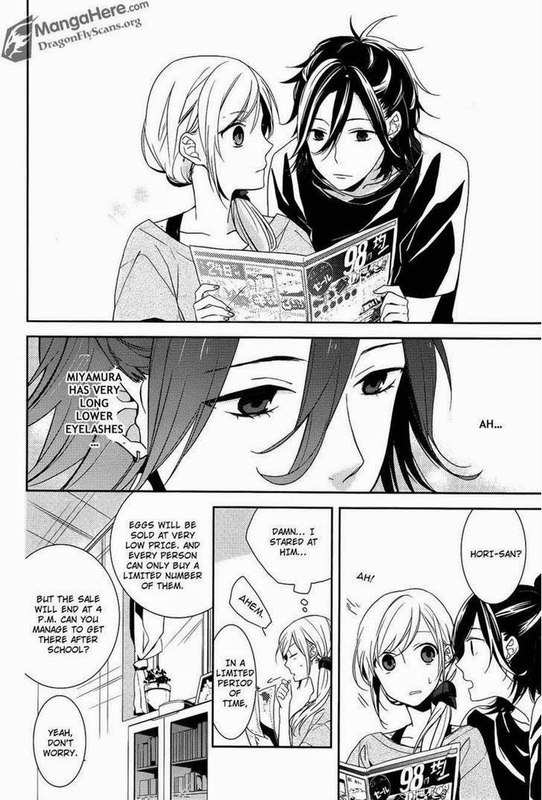 Despite the uncertainty Hori and Miyamura have about their relationship, Horimiya is a very lighthearted and sweet read. The interactions between not only Hori and Miyamura, but also the rest of the cast feel very natural and often caused me to grin or chuckle. Every character is distinguishable from the others and the designs are simply eye-candy. 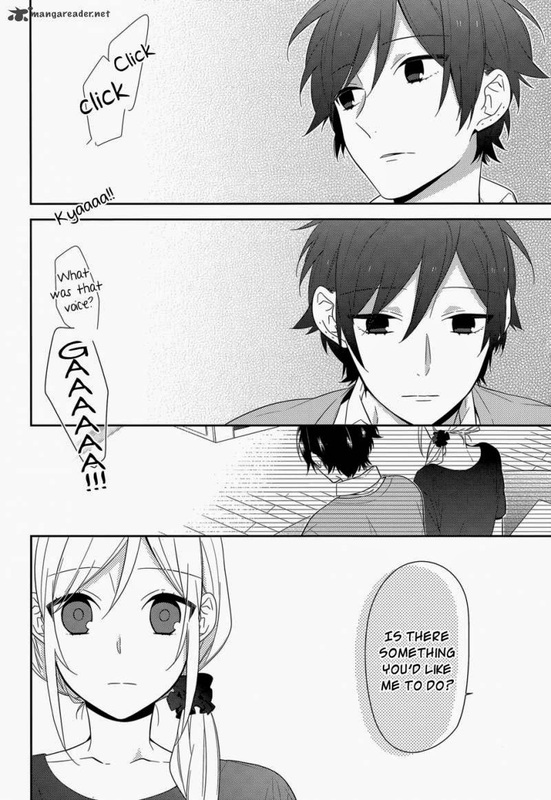 Yet, even though Horimiya's characters look great, its background detail isn't anything special. The school windows, desks, and so on are average in terms of how high school settings go. In many panels, it's even just the characters on a white and gray background. Despite this flaw, I find the characters' designs to make up for the lack of detail, especially Miyamura's transformation from his school image to his true image.